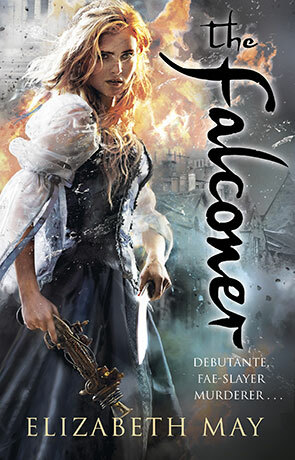 The Falconer by Elizabeth May is the first in what appears to be a series of books following the adventures of Lady Aileana Kameron (or Kam) as she lives the double life of daughter of the Marquess of Douglas on one hand and the life of a fairy hunter (or aforementioned Falconer) on the other. The story is set in the 1800s in Scotland, with ornithopters, locomotives, blunderbusses and clockwork devices as well as magic and fairies. The quote at the back of the book says “Jane Austen’s high society and the Grimms’ fairy tales”, and while that is perhaps true, I would go with “Historical Fantasy” or maybe “Victoriana Steampunk with faeries”. The tale follows Kam through high society balls and chaperones while all the time she is on the lookout for faeries. The faeries of this tale are not the friendly kind you might find on a child book shelf, but bloodthirsty ones who feed on the blood of humans. Most people can not see faeries and without being in contact with a certain rare herb; seilgflur. Kam attended a ball as a child with seilgflur platted in her hair by her mother and that is when she saw her first faeries, when they killed her mother. Kam now trains in secret with Kiaran, a faery who has sworn never to kill a human again, to be ready to get her revenge on the baobhan sith, Sorcha the faery who killed her mother, when she returns. The duality of Kam’s life emphasises the gendered role of obedient daughter within a rigid society by its contrasts. He own wishes and desires for her life are plainly stated by her father (as the enforcer of the Victoria social standards) as “not important” when compared to what people might think. This view clashes harshly with her role as a fighter with no allowances for her species (as not fae) never mind her gender. An issue highlighted in this historical fantasy concept, but that still resonates in our society today. This book is very on trend for supernatural fiction, after all faeries are the new vampires. May’s writing follows in the relatively recent footsteps of Cassandra Clare and Melissa Marr or possibly even Laurell K. Hamilton’s Meredith Gently books (without the adult content) and readers who like those books might want to read this also. While not specifically marketed at young adults, I feel it could be enjoyed by teenagers and adults. The book is fast paced and easy to read, which is an excellent way to start a series. The main characters are well rounded and believable. Small flaws and disagreements making them likeable rather than too perfect. The ending is a little confused, but it does not really cause a problem. Overall, a good read from a relatively new author and is absolutely worth picking up. Written on 22nd February 2016 by Karen Fishwick.